This week, America celebrates a national holiday, called "The Super Bowl". This Sunday, the two best teams in football meet to decide who is champion. How would you decide who is the best catalog brand in the world? Well, Super Bowl style catalogers do many things well, don't they? A Super Bowl cataloger doesn't mail catalogs to customers who don't want them, and doesn't mail catalogs to customers who don't respond to them. A Super Bowl level cataloger uses sophisticated mathematics to identify the half or more of the customer base that simply won't respond to catalogs. Contact me for help with this! A Super Bowl cataloger is a true merchant. A merchant believes in product. A marketer believes in offers and audience development. Both are needed, but marketing is feckless if the customer doesn't want the merchandise you have to offer. A Super Bowl cataloger believes in operational excellence. The Super Bowl cataloger realizes that delivering product in two days with free shipping or $5 shipping generates more long-term revenue than charging $14.95 for seven day shipping. A Super Bowl cataloger doesn't listen to the pundits. Instead, the Super Bowl cataloger charts a course, and causes others to follow. Multi-channel, Social Media, Mobile Marketing, Conversion Rate Optimization, and a plethora of best practices are just noise to the Super Bowl cataloger. The Super Bowl cataloger cares about meeting the needs of the target customer. A Super Bowl cataloger doesn't care about catalogs. The Super Bowl cataloger only cares about connecting customers with merchandise, and does not care about the distribution channel that facilitates the connection. A Super Bowl cataloger develops people. A Super Bowl cataloger has a plan for every employee, capitalizing on strengths, and where appropriate, correcting weaknesses. The Super Bowl cataloger does not outsource proprietary knowledge to vendors. A Super Bowl cataloger respects vendors. A Super Bowl cataloger does not try to squeeze vendor profit margin --- but instead pays more if the vendor helps generate success. A Super Bowl cataloger obsesses about online landing pages more than the brand obsesses about catalog spreads. Why? Because landing page optimization can be done in real-time, whereas catalog spread optimization happens soooooo slowly. A Super Bowl cataloger is interested in learning in real time. A Super Bowl cataloger thoroughly understands that customer loyalty marketing is mostly bunk. A Super Bowl cataloger thoroughly understands that customer acquisition is the "secret sauce" that fuels long-term business health. A Super Bowl cataloger listens to customers. A Super Bowl cataloger leads customers. A Super Bowl cataloger creates a forum where old-school catalog experts teach the time-honored rules of direct marketing to online newbies. A Super Bowl cataloger creates a forum where online experts teach old-school catalog experts how modern customers behave. A Super Bowl cataloger does not blindly believe the results of matchback analytics. A Super Bowl cataloger understands that contact strategy testing and holdout testing is as important as any other marketing tactic. A Super Bowl cataloger understands how to make tradeoffs in contacts between e-mail marketing and catalog marketing. A Super Bowl cataloger knows that Paid Search is an important customer acquisition tool. A Super Bowl cataloger knows that Paid Search complements catalog mailings to housefile customers --- without Paid Search, catalog response decreases. The Super Bowl cataloger allocates Paid Search expense against the catalog (i.e. searches that do not result in purchases are expensed in the catalog profit and loss statement). A Super Bowl cataloger pays employees who generate orders outside of their job description at the same rate that a Super Bowl cataloger compensates Affiliate Marketers. A Super Bowl cataloger sees the contact center and distribution center as an arm of marketing, and not as an expense to be managed by Finance. A Super Bowl cataloger understands the critical importance of gross margin management. A Super Bowl cataloger would rather be out of stock on items than overstocked. Ok, time for your thoughts. What else does a Super Bowl cataloger do? Ok, so you are the CEO, and you have a customer data infrastructure in place. You have outstanding customer reporting via Dashboards filled with KPIs (key performance indicators). You have always been able to answer any customer question, because your marketing team loves to drill down into the data to answer questions. Now you want to act upon what you've learned. It is time to rebuild your marketing department around an individual called The Targeter. The Targeter doesn't care about how data is organized, and doesn't care about learning new and insightful things about customers. No, The Targeter is hyper-focused on one thing ... getting the right message in front of the right individual. If you want to rebuild your marketing department around a Targeter, you are taking a risk. The Targeter demands complete control over customer decisions. The Targeter wants to make decisions that are the most profitable decisions for your company. In other words, The Targeter is going to potentially go after sacred cows. The Targeter may decide to cut your catalog circulation by 30%, because it is the most profitable thing to do. The Targeter may decide to go from two e-mail contacts per week to four e-mail contacts per week, because it is the most profitable thing to do. The Targeter may decide to give Google additional customer and merchandising information because it is the best way to put the right ad in front of the right individual. The Targeter loves tactics like Free Shipping, or % Off Promotions, or GWPs (gifts with purchase), or Shopping Cart Abandonment re-marketing programs. The Targeter actively tries to link the promotion with the customer in order to grow the top line. In many ways, The Targeter is a classic direct marketer. You do not rebuild your department around a Targeter when the marketing world is changing, because The Targeter loves to compile knowledge about past successes in order to drive future sales increases. The Targeter is not motivated by emerging channels that have minimal ROI. Instead, The Targeter is motivated by Best Practices, by things that have been proven to work in the past. The Targeter will rebuild a department around campaigns, not customers. The Targeter is motivated by customer understanding, but only to the point of linking customers to campaigns. The Targeter is not going to enjoy a month-long strategic project with McKinsey Consulting, because that project is not as likely to deliver ROI as is a project that links customers who love Free Shipping to various promotional vehicles. A CEO rebuilds a marketing department around a Targeter only when the existing data infrastructure is in place, and only when there are folks in the marketing department who are great at "Mining" for customer insights. If those two criteria are met, then a Targeter becomes a valuable marketing leader, one who can deliver significant sales increases and profit improvements. You determined that you need to rebuild your marketing department, and are looking for an analytically oriented leader. You've taken the quiz, and you understand more about the five different Analytics Personalities. Under what circumstances is a Miner a good investment? You want to rebuild your marketing department around a Miner when you want to learn more about how your customer is behaving. You don't hire a Miner until you had an Organizer build a customer data infrastructure for you ... the Organizer links customer data across all channels, and creates a reporting infrastructure that allows all Executives to be able to understand basic facts and findings about customers. Once this infrastructure exists, you are ready to rebuild your marketing department around the skills of a Miner. The Miner is motivated by "drilling down" into customer data to understand how customers are behaving. This type of individual is perfect when business is "changing". If you are dipping your toe into social media or mobile marketing, then this type of marketing leader will provide the data necessary to explain to the company how these emerging channels influence customer behavior. You'll want a Miner if the rest of your Executive team is highly inquisitive. You'll want a Miner if the type of questions that your Executive team asks are "unique" ... in other words, if you want the same answers to the same questions, you hire an Organizer ... but if your questions evolve and change over time, seldom repeating, you want a Miner, because the Miner is motivated by an evolving and changing customer ecosystem. If you can cope with uncertainty, hire a Miner. You hire an Organizer when you thrive in a world of certainty and consistency. Once you hire a Miner, it is your job to motivate this person. Do not put this person in charge of KPIs and Dashboards and customer table development, because this person isn't motivated by these challenges. The Miner is motivated by answering new, unique, challenging questions. Do not, however, expect the Miner to lead the company to a new strategy. The Miner is motivated by the act of mining data, not by leading the company down a new strategic path. You will be responsible for determining strategy if you hire a Miner. A CEO with strategic focus and a Marketing Executive with Miner tendencies can be a powerful combination. If your customer data infrastructure is in place, but you don't know how customers are behaving, a Miner is a good choice for your rebuilding efforts. The nice people at Zippycart and I had a fun exchange about free shipping strategy. Please click here and visit Zippycart to read my take on Free Shipping as a part of a catalog/e-commerce business model. And please click here to visit Zippycart, read their take on Free Shipping! Now that you've read each perspective, why not leave a comment to describe your perspective regarding Free Shipping. Join the discussion about Free Shipping as a profitable component of an e-commerce business model. Open your spreadsheet (contact me for your copy), and take a look at cells J19 - N19. Cells J15 - N27 illustrate simulated/projected growth in different merchandise divisions during the next five years. Remember, this is a business that is forecast to shrink significantly over the next five years. But the merchandise division in cells J19 - N19 is forecast to grow! In fact, this isn't the only merchandise division forecast to grow in the next five years. Look at J23 - N23. When a business is struggling, there is often data available, data that shows the Executive a path to a profitable future. You just need the tools to demonstrate the profitable path to the future. Click here to buy the book on Amazon.com ... or have me build an OMS spreadsheet for you by clicking here. Welcome to the Gliebers Dresses Executive Meeting. I've been invited back this week, in fact, I've been invited to sit in, in person. Glenn Glieber (Owner): "So that's the year in a nutshell. We lost $800,000, yet another year where we didn't meet expectations. But maybe we weathered the storm. Maybe we have something to look forward to in 2010. We have a new catalog contact strategy that is off to a good start, thanks to Pepper Morgan, in fact, the new strategy is 15% over plan, so that's amazing! And we're going to ride our loyalty program through mid-year, to see if it can deliver the results that were promised." Roger Morgan (Operations and IT): "I see we have Kevin in the room today. Did we want to ask him questions now, so that he can leave and then we can focus on more important things like company strategy?" Meredith Thompson (Merchandising): "Hi Kevin, nice to have you back. We heard you worked on a project for Anna Carter during the past month, is that correct?" Kevin: "Yes, I worked on an Online Marketing Simulations project with their Executive team." Roger Morgan: "What did you learn? Did they kill their catalog and now they're struggling to stay afloat? I'll be that's what happened, right? They probably wanted you to talk about our catalog strategy secrets. Idiots." Kevin: "You know I cannot share those findings with anybody." Lois Gladstone (Finance): "I'll bet they wanted to know all about our loyalty program, didn't they? They are probably having big problems without having a catalog to support their business. I heard their business last Fall was down 30% to last year. HA! Serves them right. I'll tell you what, we sure weren't down 30% last Fall." Roger Morgan: "But did you learn anything about how they drive sales without a catalog? I heard from our Woodside Research rep that they're doing some really interesting things with landing pages, something about the way they are leveraging their IT staff to create customized employee stores. I'd love to learn about that." Kevin: "They did share a lot of their strategies and initiatives with me. Of course, you know I cannot share those findings with you." Pepper Morgan (Marketing): "I'm following the Twitter feed of their Chief Merchandising Officer. She has a daily special on Twitter ... she introduces one new item a day, and her items do not appear anywhere else on the site except via a landing page that you click through via Twitter. When you check out, you have to enter her Twitter ID in order to be able to purchase the item. It's like she's developed her own marketing program for new items, she's created exclusivity. And heck, she has 14,995 followers. I've never seen a strategy like that. Does that work, Kevin?" Lois Gladstone: "Their CFO also has a Twitter presence, with 82 followers. And she's hawking merchandise, too. You know, I cannot imagine an environment where you'd let your own employees do their own marketing. What do you do, pay them a commission each time they sell something?" Roger Morgan: "And imagine the IT nightmares you'd have. You have to enter a Twitter ID on the order form in order to purchase the item? What a terrible customer experience! You make things as easy as possible for the customer, you don't ask them to enter a Twitter ID. Heck, we'd have to put something like that on our book of work, and prioritize it with everything else we're doing." Meredith Thompson: "Honestly, my time is better spent finding great new fashion merchandise than hawking my own wares. I don't have the time to do what they're doing. I think it is the job of marketing to promote my product. And Pepper's new catalog strategy is +15% to plan, so she's clearly doing her job the right way!" Pepper Morgan: "I counted over 100 employees who have either a Twitter presence or a blog on the company blog page. It seems like it is an organized yet decentralized marketing strategy they are trying to employ." Roger Morgan: "It sounds like the desperation of a company that killed a catalog program and is now trying to find ways to recoup the 30% sales drop they experienced. Idiots. Our rep at ResponseShop told us they'd be doing desperate things once they didn't have the multichannel marketing support of a catalog, and now, sure enough, they are doing amazingly desperate things." Lois Gladstone: "I noticed that they have an iPhone app that takes you to a micro-site that has merchandise that is only available on the micro-site. Isn't that nuts? Aren't you supposed to integrate all channels? Why would you only offer special merchandise for iPhone users? That's arrogant. It seems like they are grasping for straws." Roger Morgan: "Woodside Research says that mobile commerce will outpace e-commerce by 2021. That's way out in the future. So why would you want to be on the bleeding edge of mobile commerce? I'll tell you what, there's still nothing like receiving a catalog in the mail, thumbing through it, and then carefully ordering merchandise on a secure e-commerce website. Who even wants to shop on a 320x240 pixel screen? What a terrible customer experience! Don't these new marketing gurus know anything about how actual customers shop? Did Anna Carter adopt a marketing strategy from the blogosphere? Geez. That's desperate. Those vendors and bloggers don't have any skin in the game. It's easy for them to tell us to do something, they don't have p&l responsibility like we have." Meredith Thompson: "And Pepper's new strategy is up 15% to plan, so the key to catalog marketing is all about finding the secret sauce. I think marketers spend too much time on the shiny new toy, and not enough time optimizing existing marketing channels." Roger Morgan: "I heard that we're going to be eligible for all sorts of paper discounts this year as well, so if catalog marketing becomes a bit cheaper, we can leverage it to a greater degree." Lois Gladstone: "Kevin, why would Anna Carter's CFO be on Twitter? It doesn't make sense." Kevin: "Again, I cannot share their strategies or their reasons for executing different strategies." Roger Morgan: "Well then why are you even here?" Kevin: "Let me ask you a couple of questions, Roger. First, you've been here throughout the entire downturn that Gliebers Dresses experienced. What percentage of the downturn would you attribute to your strategies, to company strategies, to the economy, and to the shift from print marketing to digital marketing?" Roger Morgan: "I doubt my strategies play a role in our sales, I'm only the operations guy. I think our problems are half due to the economy, and half due to the shift from print marketing to digital marketing." Kevin: "Ok, well, you cannot control the economy, so then the stuff that is within your control is, in your opinion, due to the shift from print marketing to digital marketing, right?" Roger Morgan: "I guess so." Kevin: "So let me ask you another question. If the shortfall in business is due to a shift from print marketing to digital marketing, do you not have a responsibility as a Vice President at a major company to try digital marketing strategies, in the hope of finding something that might work? Is it not your job to mitigate the decrease in sales with a new strategy?" Roger Morgan: "Of course it is. That's why we have a book of work. That's why I prioritize all projects, focusing on those that have the best ROI." Kevin: "Why don't you tell us what the top three projects are, based on your estimation of ROI?" Roger Morgan: "Let's see. The top three projects right now are to eliminate invalid free shipping codes found on rogue sites on the internet, then to enable employees to get 15% off of all merchandise purchased in employee orders instead of the standard 20% they've always had due to a new expense control project, and third is to log the number of minutes employees in the contact center spend talking to customers to see if we can trim expenses in some clever way." Kevin: "If in your words the biggest issue within your control as a business is the shift from print to digital, then why have you prioritized the three projects you mentioned as most important, given that not one of those projects deal with the shift from print to digital?" Lois Gladstone: "I don't see how this line of questioning benefits any of us. Roger does a good job." Kevin: "I'm sure he does a good job. But none of the three most important priorities on Roger's book of work have anything to do with selling merchandise in a digital marketing environment. If your company is being hurt by the transition from print to digital, as Roger suggested, shouldn't the top three priorities have something to do with facilitating a digital customer experience?" Kevin: "What I can tell you is that there are companies out there who are fully embracing this transition. There are companies that use web analytics to measure website performance in real time, and make strategic merchandising changes on the fly. These companies are re-wiring their own neural systems to handle the complexities of modern digital marketing. What they are doing isn't easy, and is fraught with failure. But they are trying. They prioritize digital projects over analog projects, forcing themselves to manage a future they don't yet understand." Lois Gladstone: "Those are good points, we'll take them under advisement. But I look at what Anna Carter is doing, and I just think they are grasping at straws. I think with Pepper's new catalog strategy, and the 15% increase we're seeing, that we can just double-down and try harder and make 2010 work. Then we'll address 2011, we'll keep making incremental improvements. Customers love catalogs. I was at Applebees last week, and there sat a couple, probably in their early 60s, each reading catalogs while waiting for dinner. The wife wanted a new sofa, the husband said something about buying new shoes. See, that's what we're talking about here. We can grab market share among a receptive audience." Roger Morgan: "EXACTLY! Kevin, I think we're done with your questions for today. You can leave now. Folks, let's move on to the strategic portion of our meeting. Let's talk about the change from 20% off of company merchandise for employees to 15% off. Lois, how much profit will this generate in 2010, based on your estimates?" Ok, you've finally submitted your Annual Sales Plan for 2010. Now what? It's time for forecast accuracy! In e-commerce activities, I like to evaluate forecast accuracy on a monthly basis. In other words, each of your primary e-commerce micro-channels are evaluated against their forecast each month. You sum all Affiliate demand, and compare it against your forecast. You record the absolute value of your forecast error (-8% and +8% are both reset to 8%). Repeat this process for all micro-channels (e-mail, paid search, natural search, each catalog you mailed last month). Calculate the absolute average forecast error (8%, 3%, 20%, 4%, 1% = 7.2%). Your absolute average forecast error should be less than 8%. This is the number you evaluate your forecasting experts against. Each month, your absolute average forecast error should be less than 8%. Now, here's the good part! After the first month is in the books, you are allowed to adjust your forecasts by advertising micro-channel. In other words, if e-mail marketing exceeded plan by 15%, and you have reason to believe that e-mail marketing will perform at 15% above forecast/plan for the rest of the year, go ahead and adjust your forecast. In subsequent months, you compare your forecasts to the revised forecast. You'll find that your inventory team and your finance team will LOVE you if you get this part of the job done right! In fact, you'll become THE person the company looks to, when wanting to know "what the future holds". This is the best way, in my experience, for a garden variety analyst to gain Executive exposure. Simply own the forecast for where your business is heading, and you'll become an integral part of your Executive team, without having to deal with the pressures of being a real-life Executive. 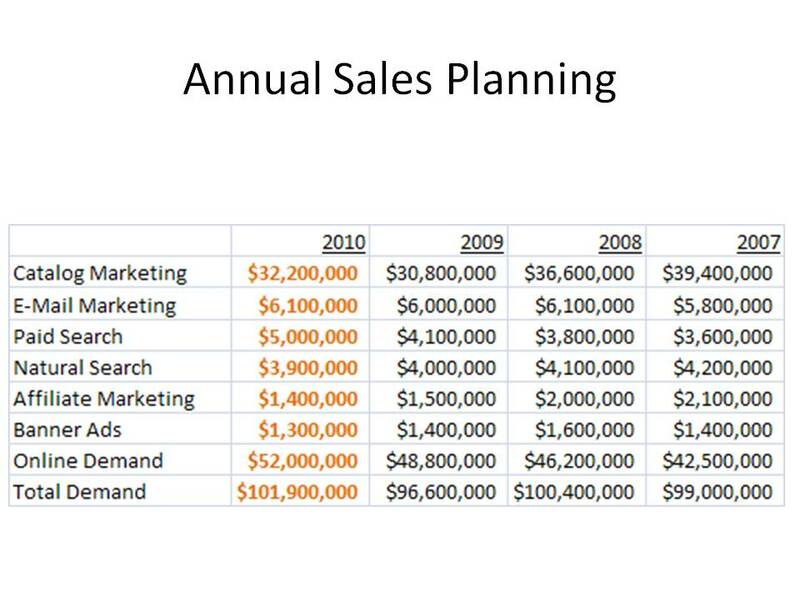 As you've heard me say previously, Annual Sales Planning is a lost art. For many of you, a new fiscal year begins on or around February 1. Your Finance department demands an air-tight financial forecast for the year. Your job is to provide the air-tight financial forecast. Here are five things to avoid. Avoid This: Do not put a "merchandise productivity" factor in your forecast. Just because the merchandising division believes that this year's assortment is "trend right" doesn't mean that you "put belief in the bank". Do not add a 5% factor to your forecast, or you are likely to miss plan, causing you to liquidate merchandise, causing you to miss your gross margin forecast, causing a lot of employees to not get bonuses, causing your business to be less profitable, potentially causing employees to lose their jobs. Avoid This: Do not put a "conversion rate scalar" in your forecast. Just because you are working with a wizard who knows how to improve homepage or landing page conversion by 11.3% doesn't mean you are smart enough to forecast the improvement eight months ahead of time. Too often, improvements are "short lived", meaning that the customer becomes bored with the change, or the competition catches up with you, or you improve conversion rate but that only reduces visits (i.e. the customer would have purchased across two visits --- and now purchases in just one visit). Allow the changes to work, then "beat your plan", and let everybody look good. Avoid This: Do not put a "creative factor" in your forecast. Your creative and marketing organization might feel strongly about their new initiatives. Never bank on these initiatives! How could anybody ever know if new imagery will result in a 4% sales increase, six months before the new imagery is to appear? Avoid This: Do not put an "economic uptick factor" in your forecast. How the heck do you know that the economy will be 7.2% better in Fall 2010, compared with Fall 2009? Let people talk about this, but protect your company from buying inventory to cover a theoretical economic improvement that may never happen. Avoid This: Do not put a "marketing improvement factor" in your forecast. How does anybody know that the October 6, 2010 e-mail marketing campaign is going to outperform a comparable campaign in 2009 by 13.4%? Focus on what you know, and what you know is how things performed last year. I've seen entire profit and loss statements ruined, not because of customer productivity issues, but because of terrible planning assumptions that caused a company to over-buy merchandise, requiring markdowns and liquidations and gross margin erosion. Don't go there! Stick to the facts, please! Online Marketing Simulations: The Secret! Recently, we worked through a spreadsheet exercise (e-mail me for a copy of the spreadsheet) that illustrated how hard it was to make sure that good customers stay good customers. In fact, it is very, VERY hard to keep a customer for life. Customers evolve and change. You enjoy every moment the customer wishes to share with you, then you let the customer go and find a new one to replace her. Just look at how important customer acquisition is in the spreadsheet. Enter "0.00" in cells C6 - G6 ... by year 5, a $63,000,000 business becomes a $28,000,000 business. In other words, you can focus on customer retention until the cows come home, but it is customer acquisition that, for all businesses except maybe Wal-Mart, Target, McDonalds, and Starbucks (and other businesses of their scale), fuels the future success of the business. Almost nobody talks about finding new customers. This means that few people have discovered "the secret" to a healthy business. Why can't you apply "the secret" to your business, before others discover it? Customers who purchase multiple items on a first order. Customers who purchase from multiple merchandise divisions on a first order. Customers willing to pay full price on a first order. Customers willing to pay for shipping.handling on a first order. Customers who buy expensive, not discounted items. Customers who are likely to purchase again in the next twelve months. Customers who are likely to buy from another advertising micro-channel in the next twelve months. Customers who buy from your brand (i.e. your website) and not from your brand via another brand (i.e. Amazon, Affiliates). Use Online Marketing Simulations to identify these traits in new customer acquisition sources, and grow your business! 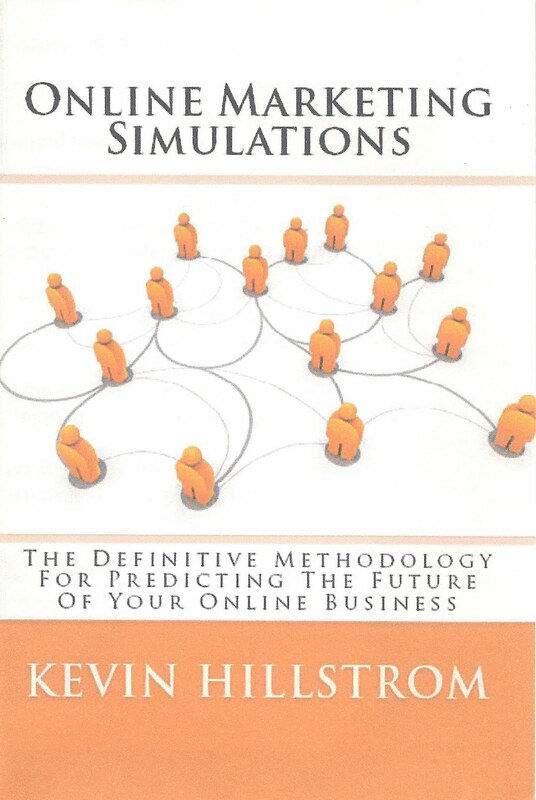 Click here to buy the book, "Online Marketing Simulations". Click here to hire me for your OMS project! A quick read through the marketing literature suggests that there are few things that are more important in the online world than improving conversion rate. I will concede this. It is important to improve conversion rate among first time visitors, or among visitors who have never purchased before. Now, let's think about our existing customers, those who have previously purchased from our business. Does conversion rate matter? If you look at simple web analytics metrics, you'd be inclined to think that conversion rate means everything. If the customer doesn't convert, you lose the sale. If you look at customer metrics, measured over the course of a year, you'll see a completely different story. In the past decade, conversion rates have declined. 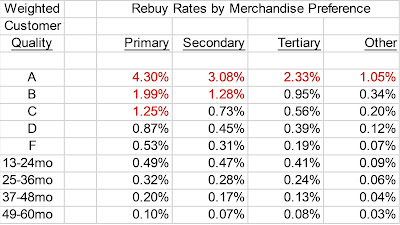 And yet, on average, existing customers repurchase at the same annual rate, ordering a similar number of times per year, buying a similar number of items per order, and paying a similar price per item. In the past few years, marketing experts have done outstanding work developing tools and techniques that greatly improve conversion --- we read about the techniques every week in trade journals. And yet, on average, existing customers repurchase at the same annual rate, ordering a similar number of times per year, buying a similar number of items per order, and paying a similar price per item. In 2008, 1,000 existing customers visited your website an average of twelve times per year. 300 existing customers purchased, purchasing two times each. Total purchases = 300 * 2 = 600. Total visits = 1,000 * 12 = 12,000. Conversion Rate = 5.0%. In 2009, 1,000 existing customers visited your website an average of thirty times per year. 320 existing customers purchased, purchasing two times each. Total purchases = 320 * 2 = 640. Total visits = 1,000 * 30 = 30,000. Conversion Rate = 2.1%. As a merchant/marketer, you have done everything right. You were successful, getting 7% more existing customers to purchase than last year. According to conversion rate metrics, you are a failure. A thousand different individuals offer solutions to solve your conversion issues. I want my best customers to visit my website every single day. I don't care if they convert or not, so long as on an annual basis, retention rates increase, orders per buyer increases, items per order increases, and price per item purchased increases. If you need help analyzing whether conversion rate changes are truly an issue, please contact me. When you are reviewing your sales plan for 2010, does it pass "the smell test"? One of the first things you do when creating an annual sales plan is you build a sales forecast assuming that there are no changes in your advertising budget. In other words, if all things are kept the same, what will the business look like in 2010? When you look at this table, are there any numbers that stand out, that don't look right, that don't pass "the smell test"? Look at the catalog marketing number. Sales via the telephone (catalog marketing) have declined by ten or twenty percent, per year, for the past three years. And yet, the business leader that approved the forecast is projecting an increase in 2010. Just looking at the numbers, assuming no advertising changes whatsoever, what would you project for a catalog marketing number in 2010? Look at the Paid Search number in 2010. In a case like this, one needs to challenge the marketing executive, asking for the facts that cause this number to increase. What is being executed, from a Paid Search standpoint, that causes the marketing executive to think that sales will increase this much without a change in advertising spend? Look at Online Demand for 2010. Again, this appears to be a reasonable increase, but what are the underlying metrics that cause this to happen? Increased traffic? Improved conversion rate? The marketing executive must demonstrate that, without a change in advertising budget, these metrics tie out in a way that causes an increase in volume. When planning sales for 2010, you first create a "base case", one that shows what happens to the business without any changes to the advertising budget. This forecast must pass "the smell test". Once it passes "the smell test", you may move forward with changes to the marketing plan. Annual Sales Planning is a lost art. In E-Mail Marketing, Annual Sales Planning is an art that was never crafted! Here's the problem. Traditional E-Mail Marketing metrics (open rates, click-through rates, conversion rates) only measure what a customer does during a small window of time. So if an E-Mail Marketing program is delivered on a Monday, causing a customer to buy on Monday, but causes the customer to skip a purchase that would have happened on Thursday, you miss the lost sale on Thursday --- you only record the positive, you never record the negative. That, my friends, is a problem. It means that you significantly overstate the importance of e-mail marketing. Marketers avoid this problem by analyzing the results of mail and holdout groups. For instance, say you have an e-mail marketing list of 1,000,000 users. In each e-mail campaign, you mail 80% of the list, and you hold out 20% of the list. (At this point, folks in the e-mail marketing community can be heard shrieking, as this goes against all established best practices). We want a huge holdout group so that we can accurately measure what impact e-mail marketing has on other micro-channels. Does e-mail marketing help or hurt search marketing, for instance? I'd want to know that, wouldn't you? This table represents the secret that is obscured by traditional e-mail marketing metrics (open rate, click-through rate, conversion rate). Look at Telephone Demand --- if you send an e-mail marketing campaign, then Telephone Demand decreases. This means that the e-mail marketing campaign caused some customers to change their behavior, switching previously planned telephone orders to the e-mail channel. 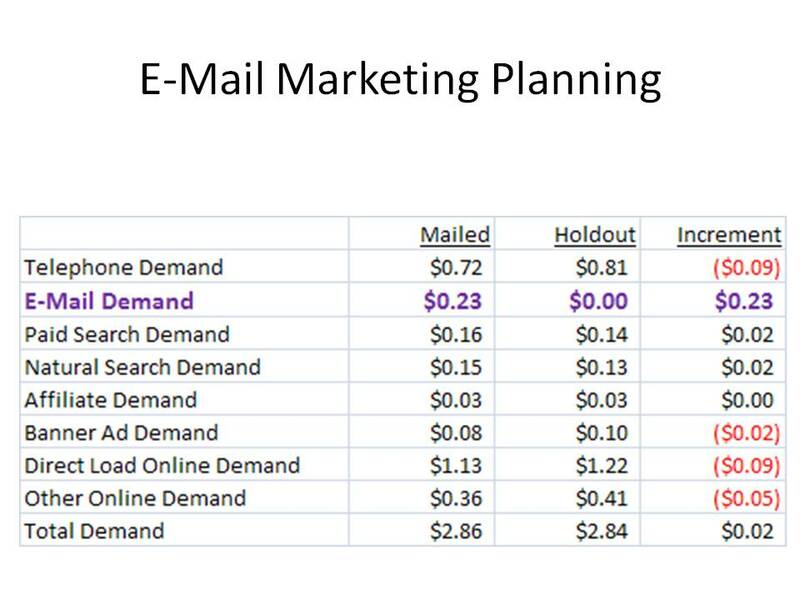 E-Mail marketing generates $0.23 of demand ... this is what would typically be measured by e-mail marketing programs. Now look at Paid and Natural Search. There are small increases. This means that e-mail marketing causes a customer to go out and search for information. Your e-mail marketing program may actually cause an increase in the Paid Search budget. Don't you want to know that, and budget for that accordingly? Notice that e-mail marketing cannibalizes ordinary online channels. 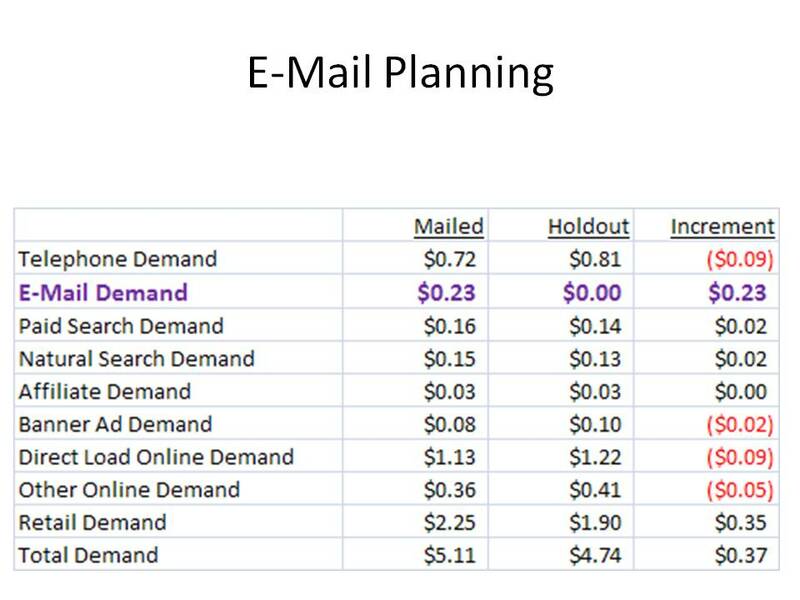 In this example, e-mail marketing is estimated to generate $0.23 demand per customer --- but in reality, it is truly generating $0.02 demand per customer. This is a common outcome among online brands and catalog brands. For retail brands, we often see the opposite outcome. Often, in retail, we see that e-mail marketing generates MORE demand than is measured via typical e-mail marketing analytics. Classic e-mail marketing fails to capture all of the incremental retail volume driven by e-mail marketing. I find it fascinating that e-mail marketers don't ever talk about this --- their marketing programs generate tons of retail volume that they don't ever get credit for, and e-mail marketers don't seem to care about this. The modern Executive knows exactly what happens to every channel when e-mail marketing is increased, or withheld. The modern Executive uses this information in Annual Sales Planning, knowing that the information gives the leader tremendous strategic latitude. The modern Executive is not a slave to "comping what was done last year". We're talking about Annual Sales Planning this month, a lost art in the e-commerce era. With most web analytics tools heavily focused on the tactics surrounding conversion, few people now focus on the strategic art of planning the future of a business. Last week, we studied a business that was forecast to decline by 4.4%, due to having fewer good customers after a lackluster 2009. One way to grow the business is to dramatically ramp-up new customer acquisition. This can be an expensive proposition. We can go through another exercise. Let's identify what has to happen in customer retention, in order for the business to be flat in 2010. The cells in red are the ones that I changed. I increased customer retention rates by 6.1%, across the board. When I do this, the business is flat, year-over-year. As an analyst, it is your job to communicate the productivity improvement needed to keep the business moving in the right direction. And if there isn't a marketing strategy that can improve retention by 6.1%, then it is up to the merchandising organization to sell product that is 6.1% more compelling than last year. Do you understand how this style of analysis takes the pressure off of the marketing organization? The marketing analyst sets the table, communicating to all business leaders what is likely to happen if "all things remain constant". All Executives now know that there has to be a 19% increase in new customers, or a 6.1% increase in customer retention, in order for the business to just stay afloat. Armed with this information, marketing outlines what it will do in order for the business to get closer to growth. The merchandising organization outlines what it will do in order for the business to get closer to growth. The e-commerce team outlines what it will do in order for the business to get closer to growth. All parties have a job to do, accountability can be assigned. 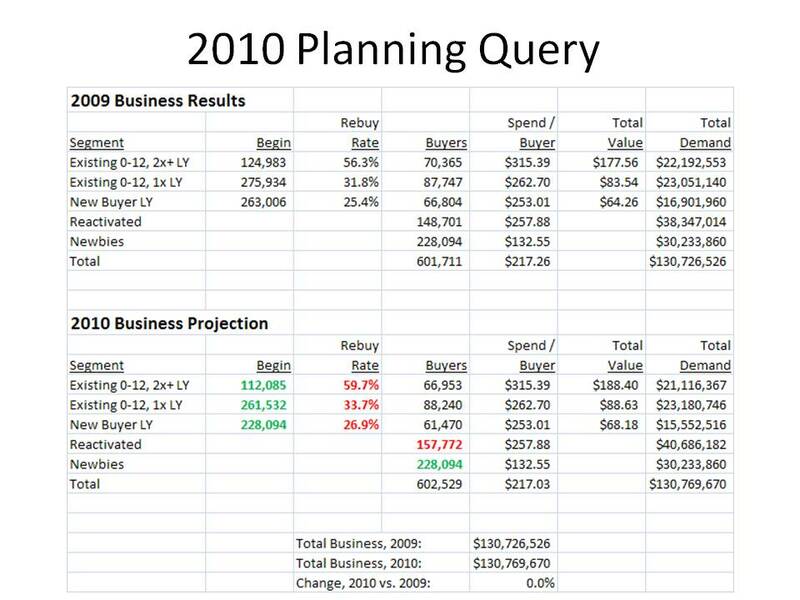 This is why we do Annual Sales Planning, a lost art in the era of e-commerce real-time software conversion analysis. A Social Media Consultant named Mack Collier holds a weekly blog chat on Twitter. This Sunday evening forum gives users an opportunity to discuss various Social Media issues. Users review content via the #blogchat hashtag. I took 71 page transcript from an April 2009 blog chat, coded each of 988 tweets among 131 users, and categorized each user into one of four Social Media user segments, based on behavior exhibited during the chat. Why not give the analysis a read, and let me know your thoughts about the analysis and findings. There are many different ways to analyze Social Media activity, this is one attempt with potentially actionable findings for companies looking to participate. Click Here For The 71 Page Blog Chat Transcript. Click Here For My Analysis Of 988 Tweets Among 131 Users. 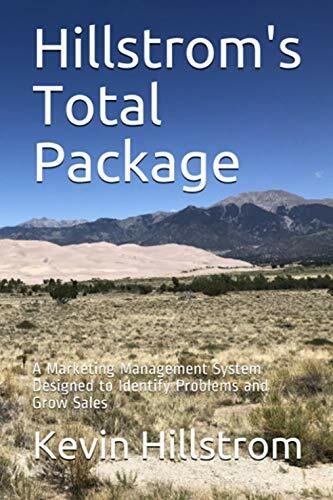 Time to open up your Online Marketing Simulation worksheets (click here to have me send you a copy, buy the book here). In the spreadsheet, enter "0" in cells B101 - B188, and enter "0" in cells B190 - B580. This means that we are going to analyze just one segment of customers, a segment that is at a grade of "B" on an "A / B / C / D / F". Recall that I grade all customers in Online Marketing Simulations, so that I can measure where these customers migrate over time. Grade of A = 436. Grade of B = 503. Grade of C = 695. Grade of D = 1,202. Grade of F = 4,226. Now, marketers think they can "fix" this problem. By initiating a loyalty program, or by simply dazzling the customer with outstanding marketing programs, we're told that marketers and vendors can "retain" your best customers. So, let's assume that you can do a better job of retaining these customers. In cells C5 - G5, enter the value "1.30". This means that we're going to do a 30% better job of retaining customers, due to a loyalty program that does a spectacular job of retaining customers. What does the distribution of customers look like after five years? Grade of A = 1,047. Grade of B = 742. Grade of C = 756. Grade of D = 1,110. Grade of F = 3,406. If you can develop a loyalty program that somehow increases retention rates by 30% per year for each of five years, you can make a difference. Grade of A = 510. Grade of B = 543. Grade of C = 717. Grade of D = 1,199. Grade of F = 4,093. Look at that! You improve retention rates by 5% a year, every year, and you basically get nowhere, do you? A 30% increase by year, every year, makes a significant difference, but is virtually impossible to achieve. So, if you want to add an additional 500 customers at a Grade of "A", how are you going to do it? Your thoughts? There are four ways that modern Catalog Marketers over-contact customers. Let's explore how each strategy is costing you profit ... lots and lots of profit. Strategy #1 = Matchbacks: When I analyze matchback analytics vs. mail/holdout tests, I observe a gross over-representation of catalog marketing effectiveness as stated by matchback analytics. We are over-circulating, usually by 10% to 50%, when we blindly follow our matchback results. I can help you fix this problem. If you are a $50,000,000 catalog brand, this level of over-circulation due to the inaccuracies of matchback analytics costs you, on average, $200,000 to $1,000,000 of annual profit. Strategy #2 = Pages: Excessive catalog pages can be poison. Given printing/postage discounts, there is a swing toward adding pages these days among some catalogers. Every time you add four pages to your catalog, you reduce circulation depth, because the incremental pages will perform below break-even to marginal customers, causing you to shrink circulation ... and when you shrink circulation, you shrink your twelve month file, and when you shrink your twelve month file, you shrink the future potential of your business. Strategy #3 = Contacts: It is common for contacts to have more impact these days than incremental pages ... two 64 page contacts a month usually outperforms one 128 page contact a month. Remails, however, should be used only when there is an absolute dearth of employee resources to create new pages ... remember, your online competition are changing landing pages dynamically, creating newness that cannot be matched by a remailed catalog. And be sure to execute contact strategy tests ... test thirteen contacts a quarter vs. four contacts a quarter vs. zero contacs a quarter ... use the results to determine the "optimal" contact strategy per segment. Strategy #4 = Catalogs vs. E-Mail vs. Search: In every business I've analyzed, there is a unique relationship between Catalog Marketing, E-Mail Marketing, and Search Marketing. Carefully test combinations of Catalog Contacts and E-Mail Contacts ... measuring the sales results across all channels. In 2010, every Catalog CEO should have an initiative to understand how each strategy outlined above impacts the bottom line. If you need my assistance with these issues, please do not hesitate to contact me. I have been invited to meet with Anna Carter, President of Anna Carter, the main competitor of Gliebers Dresses. As you may know, Anna Carter elected to discontinue their catalog in Fall 2009. Ms. Carter's office building is almost space age, in comparison with the office space leased by Gliebers Dresses. Ms. Carter's office is lined with LCD televisions on the walls. One LCD monitor posts a dashboard with call center and live chat information. Another lists daily website metrics, including conversion rates and bounce rates, new/existing visitor information, that kind of stuff. Another LCD monitor scrolls live customer feedback on Twitter. Yet another LCD monitor scrolls through updates from various fashion blogs. These monitors are posted in every Executive's office, and hang from the walls of every major congregation point in the building. In fact, all aspects of the office building are positively 2010 in nature. On-site daycare, company paid iPhones for all employees, Twitter accounts for all employees that require, as a condition of employment, one tweet per day. There is an amazing cafeteria that is subsidized at a rate of $10 per employee per day, enough money for employees to enjoy breakfast and lunch. A workout room is fully furnished with clean towels and the latest equipment, and is staffed with a Wellness Director. This individual prescribes workout routines and dietary opportunities that can be supplemented in the cafeteria. Employees can pay an annual fee of $2,500, and in kind, receive free health care for the year ... in fact, an on-site nurse practitioner deals with daily issues, referring employees to medical attention as appropriate. Employees who drive Hybrid vehicles, who take public transportation to work, walk to work, or ride their bike to work receive free health care ... their $2,500 annual health care fee is waived. In other words, Anna Carter has gone to great lengths to create an environment where an employee feels valued. Let's chat with the person behind this company. Kevin: "Thanks for inviting me to be here today, Ms. Carter." Anna Carter: "Please, call me Anna." Kevin: "Let's get right to the question most people would want to know about. Why did you end your catalog marketing program?" Anna Carter: "Oh, this is a complex issue. Let me start by asking you a series of questions, Kevin. When is the last time you subscribed to a newspaper?" Kevin: "At least ten years ago." Anna Carter: "Why do you keep a landline-based phone?" Kevin: "I need it for my DSL service, and use my cell phone for almost everything else." Anna Carter: "What is the ratio of CDs you've purchased in the past year to MP3s?" Kevin: "I think I purchased 124 songs on iTunes, and purchased one CD." Anna Carter: "When is the last time you purchased a DVD, and when is the last time you got a movie via Netflix?" Kevin: "I only purchased one DVD last year ... I get three movies a month from Netflix." Anna Carter: "What is the ratio of time you spend watching network television, vs. watching cable networks?" Kevin: "I probably only watch 4-5 shows that are on network television. Most of what I watch is on a cable network." Anna Carter: "When is the last time you purchased something from Amazon.com, and when is the last time you ventured into a department store?" Kevin: "I bought from Amazon last month, I probably haven't purchased something from a department store in six months." Anna Carter: "We could do this forever, Kevin. Times change. In 1999, I went to Tower Records, and I browsed a hundred CDs before walking out of the store with a half-dozen CDs. Today, I let iTunes and Genius recommend to me what I would like to listen to, and then wirelessly add the song to my iPod touch. It's magic. How the heck would Tower Records compete with that?" Kevin: "They couldn't. And now Best Buy and Wal-Mart are shrinking their physical music offerings, too." Anna Carter: "At some point, you ask yourself a simple question. Are you in business because of the technology that delivers product to a customer, or are you in business because of the merchandise that customers want to buy from you? The catalog is simply a technology. My brand is about connecting customers with fashion. I don't need a catalog to facilitate that connection, do I?" Kevin: "But what if the technology is still viable? Why kill the catalog altogether? Why not target it to the customers who want catalogs, and let everybody else shop online or via the micro-channels they prefer?" Anna Carter: "That's an oversimplification of an issue, Kevin. That's a theoretical question raised by folks who have a vested interest in CRM, or in selling paper or printing services, or in hosting a co-op database that pays them whenever somebody rents a name." Kevin: "Well, no, if it is more profitable to target only those customers who want a catalog, then why not make the more profitable decision?" Anna Carter: "Profit is a flexible concept, Kevin." Kevin: "How so? Isn't profit a simple mathematical calculation?" Anna Carter: "Let me give you an example. Our catalogs averaged 124 pages, and we mailed them about seventeen times a year ... no remails. This means that we had to create 2,108 unique pages each year. You don't do that with a small number of individuals, Kevin. It takes a boatload of talent to put 2,108 pages in the mail. It costs us $1,500 just to produce each page. And we paid $0.67 to put each 124 page catalog in the mail." Kevin: "And then you received $3.00 per catalog, yielding you $0.25 of profit." Anna Carter: "The issue, Kevin, is what COULD you do with the $0.67 of catalog marketing expense. Could you do something that generated a better return on investment?" Kevin: "But why not spend the money on catalog marketing and spend additional dollars on the other activities that generate a better return on investment ... then you win on both fronts, right?" Anna Carter: "That's not the way marketing works, Kevin, and you know that, you talk about that issue all of the time on your blog. We tested not mailing catalogs in Q1-2009. After two months, the performance of our e-mail marketing campaigns doubled. You mention that marketing is a big game of whack-a-mole on your blog. Well, that's exactly what it is. In our test, we learned that customers age 55 and above are nearly 100% dependent upon catalog marketing. Customers age 40-54 began to migrate to e-mail marketing, paid search, portal advertising, that kind of stuff. Customers age 30-39 were into e-mail marketing and social media. Customers age 20-29 are a whole different ballgame, we haven't learned how to market effectively to them. But in all cases among customers age 20-54, catalogs did not yield the sales that our matchback reporting suggested." Kevin: "Explain that concept to me, because the co-ops keep telling catalogers that if you don't mail a catalog, you don't get sales in other channels." Anna Carter: "Of course they tell you that, because if you cut back on catalog mailings, they lose revenue. They don't technically lie to you. They tell you that customers who received the catalog spend $2.20 online in the sixty days after receiving a catalog. Well, technically, that statement is 100% accurate. Of course, it doesn't mean that BECAUSE the customer received a catalog the customer spent money online. Our tests showed us that 50% of the demand matched back to a catalog would happen anyway if a catalog was not mailed. Kevin: "So in your case, the matchback algorithm grossly overstated how effective the catalogs were?" Anna Carter: "Exactly. We ran a profit and loss statement on the incremental demand generated by catalogs. We were generating 3% EBIT on our catalog business. I could spend $10,000,000 of marketing expense mailing catalogs to generate $750,000 profit, or I could put $10,000,000 in a CD at 3% interest and earn $300,000 profit, without doing any work whatsoever." Kevin: "You still make more money doing the catalog marketing, right?" Anna Carter: "This brings us back to the question of what we could do with $10,000,000 of catalog marketing expense. We used the results of our test to forecast what we could spend in online marketing if a catalog didn't exist. For instance, we learned that we could quadruple our paid search investment if we didn't have a catalog." Kevin: "How is that possible?" Anna Carter: "Part of the increase happens because paid search orders were no longer being matched back to catalogs, causing paid search performance to look much better. But here's the really interesting part of the equation. We took our creative staff, folks who used to work on catalog spreads, and gave them a new challenge. We assigned each creative staffer a set of keywords, and told them to design landing pages customized to the keywords assigned to them. Our landing pages were good for crap when we focused all of our efforts on catalog spreads. Our landing pages absolutely blossomed when a creative person designed a page tailored to a family of keywords. Conversion rates for tailored landing pages increased by 125% when catalog creative folks designed the pages. This fact alone allowed us to triple our paid search spend." Kevin: "But those customers have significantly lower long-term value, compared with a catalog customer, correct?" Anna Carter: "Yes, that's correct. But so what? If I can acquire 10 customers at break-even with $20 of long-term value, I am better off than acquiring 3 customers at break-even with $40 of long-term value. You simply change your mindset. You ask your people to focus on something different." Kevin: "Ok, but how do you acquire customers now that you don't have a catalog?" Anna Carter: "That one is harder to solve, Kevin. Starting in February 2010, we will offer $3 shipping on all orders, and free returns on all orders. We can do this because we know that our conversion rate will increase by 20% with this strategy, offsetting some of the lost shipping and handling revenue. And then we acquire new customers, because first time visitors to the site bail on us when they get to shipping and handling expense. We will use catalog marketing dollars to subsidize $3 shipping and free returns." Kevin: "That still doesn't solve your new customer acquisition problem." Anna Carter: "Nope, it doesn't. And honestly, I don't care. Traditional customer acquisition through list rental was wiped out by the co-ops. And now the co-ops are being wiped out by Google. In five years, the co-op business model will not work anymore for catalogers. I'd rather get a five year head start experimenting with new strategies than wait for co-op customer acquisition to completely implode." Kevin: "This has to have a brutal impact on top-line sales, right?" Anna Carter: "Sarah Wheldon thinks sales will drop by 35%. I am forecasting a 40% drop in sales in 2010. But we will be more profitable in 2010 without a catalog than we were in 2009 with a catalog." Kevin: "So you had to fire a bunch of staffers, right?" Anna Carter: "Yes, in the call center and distribution center, it wasn't pretty. But we kept about ten of our best sellers in the call center, and gave them a new title --- Social Media Store Manager." Kevin: "Describe that job title to me." Anna Carter: "Their job is to use blogs and Twitter to solve customer service problems, to build an audience, and to sell to customers. It's a $400,000 investment that we'll try for one year." Kevin: "How does one sell on Twitter?" Anna Carter: "Here's the thing, Kevin. We gave every employee, not just merchants or Social Media Store Managers, but every employee a new level of accountability. We told them that SPREADS = LANDING PAGES. In other words, everybody used to work hard to merchandise a spread in a catalog. Now, our merchants and creative staff focus entirely on creating landing pages. They get to see the performance of their landing pages, in real time, via our web analytics tool. Employees who design the best performing landing pages earn a weekly bonus. Employees who refer customers to the best performing landing pages via their blogs and Twitter accounts receive a weekly bonus. We froze salaries for 2010, and told employees that they can earn that money back via bonuses. The average employee would have received a $1,500 salary increase. As long as the employee has a social media presence and updates their social media presence at least twice a week, they get $500. Then, the best performing employees all earn bigger bonuses based on what they sell via their social media presence --- I mean honestly, we pay affiliates a percentage of every order they generate, so why not do the same for every employee? I mean, who has more passion for selling, an affiliate, or one of our employees?" Anna Carter: "It sure is. There is an insane amount of competition to create highly performing landing pages. Landing pages that don't work are killed, quickly. You have merchants doing de-centralized marketing on their own Twitter pages, driving customers to the their own landing pages. You have creative staff doing de-centralized marketing on their own Twitter pages, driving customers to their own landing pages. You have employees competing against each other, trying their hardest to outperform each other, creating a Darwinistic style of landing page evolution that we could never have learned on our own when we have a catalog. In fact, conversion rates on our landing pages have improved by 80% since we terminated the catalog and developed this style of competition." Kevin: "Have you had any problems on Twitter, using this strategy?" Anna Carter: "We have three rules. Don't lie. Always reflect the brand favorably. And you're not allowed to offer discounts or promotions. Everything else is fair game. If you want to see innovation on Twitter, you'll see it using this strategy. We have employees offering merchandise deals of the day. We have employees who offer social media links to anybody who promotes our merchandise on their blogs. In fact, we now see that 17% of our website traffic comes from social media. The important thing is to allow each employee to be their own "store manager". They get to pick and choose the landing pages that they like best, and then they are rewarded when customers buy from their landing pages or via their social media presence. I've seen merchants who earn bonuses by selling the merchandise offered by a co-worker ... if that merchandise is working better than what the merchant is selling, you'll see merchants promote other merchandise over their own. You won't see that happen in a traditional catalog business." Kevin: "All of this happens because employees aren't focusing on catalog spreads anymore?" Anna Carter: "And it happens in real-time, Kevin. If a landing page isn't working, it gets pulled down, and fast. If a catalog spread doesn't work, it sits there in homes for sixty days, and we don't fix the problem for maybe six months. We optimize our business on the fly. Do you have any idea what we've learned about customer behavior since disbanding the catalog, stuff that we never had the resources to learn previously?" Kevin: "Sounds like you need web analytics and information technology alignment to pull this off." Anna Carter: "You have no idea. It's nice to have an information technology executive who is incented to provide a framework for dynamic landing pages that can be modified by any creative staff member. And you should see the merchandising, creative, and information technology integration that happens ... they all realize that they need each other to make the business work. And you should see how merchants all of a sudden are spending time in the contact center, encouraging employees to use live chat or Twitter to promote their landing pages. All of a sudden, employees are working together in ways we never imagined." Kevin: "So this is how you make more profit than by running a traditional catalog business?" Anna Carter: "Yes, this is how you do it. But you cannot do it if you are passionate about catalog marketing. You can only do it if your are passionate about selling merchandise. This is the mistake that old-school marketers make. They are passionate about the form of distribution. The music industry wanted to sell you music via a CD, they didn't want to sell you music. The newspaper industry wanted to sell you news via paper, they didn't want to sell you news. I want to connect a woman with a dress, and I'll go door-to-door to do that if I have to. I do not care one bit about the way I connect a woman with a dress. I care deeply about having passionate employees who want to sell!" Kevin: "Based on the benefits employees have, it looks like you re-invested catalog dollars in a lot of employee programs." Anna Carter: We sure did. We built the workout center, the cafeteria, we hired a Wellness Director, we added the daycare center, we did all of that with the money we used to spend on catalog marketing. Our employees, in kind, spend more time here, they are healthier, happier, and work harder at merchandising and marketing our website." Kevin: "Thanks for taking the time to chat with me today, Ms. Carter." Anna Carter: "And thank you for spending time working with Sarah Wheldon on a five year forecast for where our business will be in 2015 without catalog marketing. I appreciate the Online Marketing Simulation work you did for us. If Gliebers Dresses invites you back, be sure to pass along my best wishes to Glenn. I'm sure that our decision to kill the catalog is absolutely knawing at him." Annual Sales Planning is an important art, one that has been largely lost in the e-commerce era, as traditional web analytics packages focus on conversions, and not on actual customer behavior measured over time. Strategically, we want to know what the future holds. We need to be able to react to business trends that are within our control. 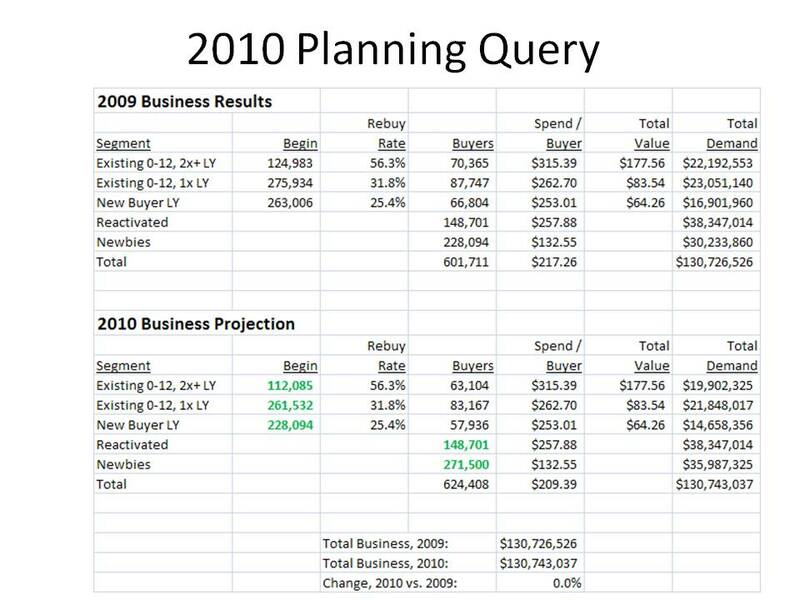 In this example, a soft 2009 yields a customer file that is likely to generate a 4.4% decrease in annual sales. So, what can we do to get business back on track? First, let's calculate how many new customers we need, in order for the business to be at the same size as last year. In this case, if I increase new customers from 228,094 to 271,500, the annual sales total is constant. Now, given that new customers dropped from 263,006 to 228,094 from 2008 to 2009, there must be a valid strategy in place to cause new customers to increase to 271,500. As an analyst, your job is to communicate to your CEO, CFO, and/or CMO what it would cost to acquire enough new customers to keep the business at a flat sales level. If that cost is prohibitive, then it is reasonable to assume that the business will decline. Next up --- we'll look at what has to happen across customer retention metrics, in order to keep the business flat.